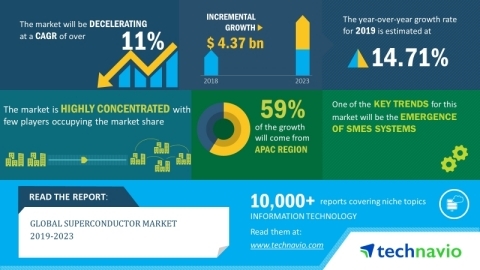 LONDON--(BUSINESS WIRE)--Technavio has announced the release of their research report on the global superconductor market for the forecast period 2019-2023. This superconductor market analysis report segments the market by product (magnets, cables, transformers, and energy storage devices) and geography (APAC, Europe, MEA, North America, and South America). Global superconductor market size will grow by almost USD 4.37 billion during 2019-2023, at a CAGR of over 11%. With the rising smart grids and renewables, and the increasing electrification of transport, the global energy storage market is growing at a significant rate. The market has recently witnessed the emergence of superconducting magnetic energy storage (SMES), a direct electric energy storage technology, which is in the early phase of commercialization. The SMES system stores the energy in a magnetic field inside of a superconducting coil. The flow of direct current creates the magnetic flow through the coil that produces the stored energy. This magnetic energy stored is easily converted to electricity for the use of power devices. The SMES market is growing significantly due to the rising adoption of distribution utilities, concerns over climate change, increasing global population, and depleting non-renewable energy resources. Vendors are also offering funding support to SMES research projects. These factors will lead to market growth which will, however, decelerate over the forecast period with a reduction in the year-over-year growth rate. The adoption of superconductor devices in medical applications is increasing at a rapid pace. Superconducting magnets have numerous applications in medical devices due to their ability to generate high magnetic fields. To enhance the overall performance of their systems, MRI device manufacturers are increasingly working on advances in superconducting technologies. The focus is to increase the magnetic fields of the devices while reducing their size. The increased adoption of superconductor devices in medical applications will drive the growth of the market during the forecast period. “Smart grids are gaining immense popularity owing to their ability to manage the power supply during a blackout efficiently. Since the electrical equipment, components, and transmission lines carry high current and high voltage at high temperatures, there is a need to use superconductor materials on an extensive scale. Thus, with the growing interest toward smart grid deployment across the world, the need for superconductor devices to be embedded in machines will increase, which will drive market growth during the forecast period,” says an analyst at Technavio.